Mix the red wine with cassis, powdered sugar, and cream until the powdered sugar is completely dissolved, then pour into the 1-Pint Gourmet Whip iSi Whipper. Screw on one iSi Cream Charger and shake vigorously. 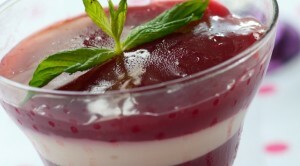 Garnish the rum plums, cooked in a little liqueur, with the well-chilled red wine cream. Double the ingredients for a 1-Quart Gourmet Whip Plus iSi Whipper. Screw on two iSi Cream Chargers, one after the other. Shake well after attaching each charger. Halve the ingredients if using a Half-Pint Gourmet Whip iSi Whipper.